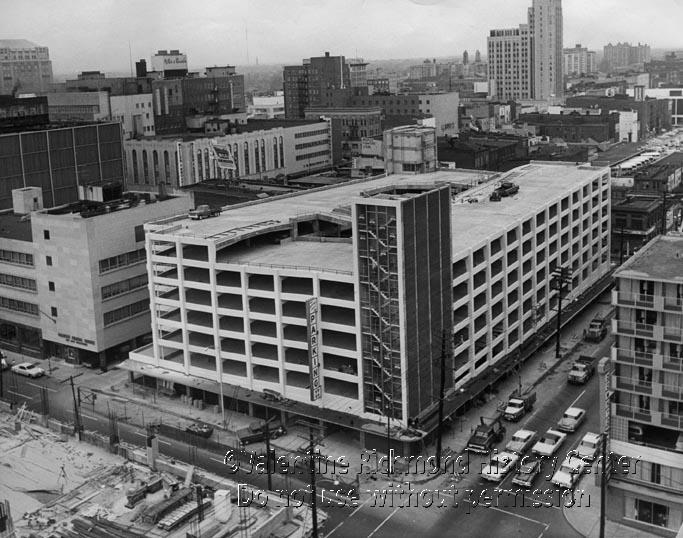 This photograph shows a new parking deck on Marshall Street in 1965. Since the end of World War II, cities began to adapt to the new automobile culture, and by the 1960s more than half of the ground in some cities’ business districts was devoted to streets and parking areas. No matter the type of transportation, cities have always been a source for traffic, and the emergence of automobiles continued this trend. New parking outlets were necessary to the growth of the city. The rise of motor vehicles in cities had many societal impacts on cities. Business areas were dispersed, the city was no longer the core of all activity, and people began to move to the suburbs. The construction of a new parking deck tells us a lot about how Richmond changed in the mid-twentieth century. “Automobile and the Environment in American History: The Automobile’s Imprint on the Landscape,” Automobile In American Life and Society, 2004-2010, accessed March 28, 2011, http://www.autolife.umd.umich.edu/Environment/E_Overview/E_Overview6.htm. “The Automobile Shapes The City: From“Walking Cities”to“Automobile Cities”.” Automobile In American Life and Society. 2004-2010. Accessed March 28, 2011. http://www.autolife.umd.umich.edu/Environment/E_Casestudy/E_casestudy3.htm.